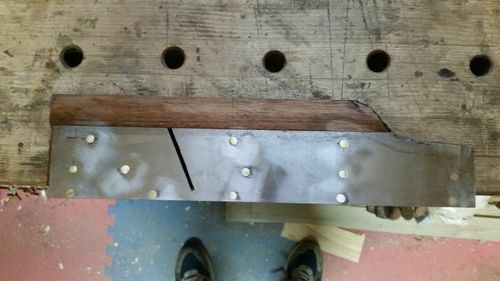 After letting the epoxy cure for a couple hours, the steel and body are now firmly attached and the machine screws holding the two pieces of steel together can be removed and replaced with slotted brass machine screws. Make sure to use a degreasing cleaner to clean any remaining cutting fluid out of the holes (I use brake cleaner again) and use some kind of thread locker on the machine screws. I use epoxy, tinted to a brass color, just in case one of the screws and the countersunk hole don’t have a good seal, but permanent Loc-tite would work, too. After this, I let the epoxy cure overnight. Next step is to flatten the metal faces. From here on out, the greatest enemy of a good result is heat. Overheating the steel will break down the epoxy and weaken the bond. Once again, it’s time to be the tortoise. 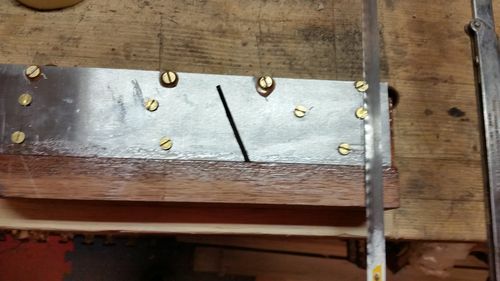 There are several possible ways to take down the screw heads. Every one has pros and cons. Other than the screws cut off with the hacksaw for the pic, I used an angle grinder with a flap wheel. Less heat than a cutoff or grinding wheel and pretty fast. 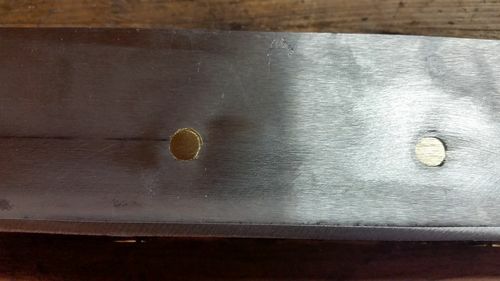 You have to be very careful to avoid creating a gouge or hollow, but it worked well. Whatever method you do, go slow and check the metal where you are working frequently. If you can’t hold your hand on it for several seconds, take a break and let it cool. 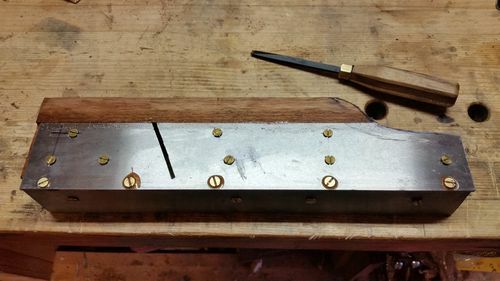 Keep in mind that the metal will transfer heat, especially the brass, and you have a large insulator on the other side to trap the heat against the epoxy. Once the screw heads are ground down, the entire surfaces can be flattened. 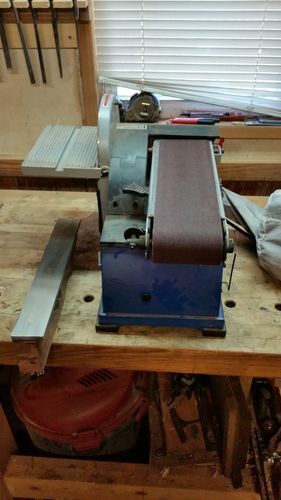 For that I used a benchtop belt sander. Here is where the blog post title comes in. A Rondo is a musical composition where the same theme comes back over and over again, interspersed with other melodies. 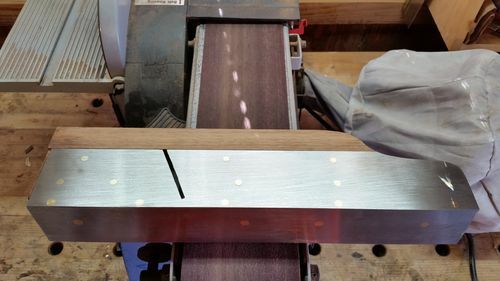 When flattening, I would run one side on the sander for a while until it started to get warm and then set the plane in front of a fan to cool while I went to do something else. Come back later and repeat. Sand, metal gets hot, go to the grocery store while it cools. Sand, metal gets hot, start supper while it cools. Sand, metal gets hot, eat supper while it cools. Sand, metal gets hot . . . . You get the picture. 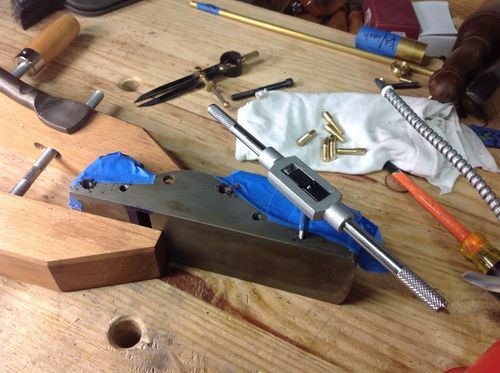 Making sure to frequently check with a straight edge and square to keep everything aligned and a good 90 degree corner where the metal meets. Overall looking good, just a bit of a gouge where the hacksaw blade bit in too much around the rear screws. It’d be perfectly fine to use, but leaving that way is not the level of craftsmanship I strive for. I’ll keep working on it in sessions until there are consistent, even scratch marks front to back. Then I’ll go up in grits to a point where it has a nice brushed finish look. This process is the biggest reason to possibly skip the screws and just trust the epoxy to hold. If you go that route, the only screw heads to take down are the machine screws and the flattening process would go pretty quickly. Once again, I feel the extra security and enhanced look are worth the time and effort. You decide what’s best for you. If someone does decide to do without the screws, I would love to know how it goes and how it holds up over time. Thanks for documenting all this, Jay! I have learned MANY steps to do differently next time. Had a nightmare trying to find brass screws that had enough material below the slot…just made my own 1/4-20 brass fasteners. Cannot imagine putting in all this time and effort and NOT screwing the guy together!